A new study conducted by researchers in the Center for Injury Research and Policy of the Research Institute at Nationwide Children's Hospital investigated bicycle-related injuries among children treated in hospital emergency departments in the United States and found that despite a decrease in the rate of injuries over the 10-year study period, there were still more than 2.2 million injuries. The study, published online in Accident Analysis & Prevention, found that from January 2006 through December 2015, more than 2.2 million children age 5-17 years were treated in US hospital emergency departments for bicycle-related injuries. This averages 608 cases per day or 25 every hour. "Wearing a helmet while riding a bike is the best way to decrease the risk of serious injuries," said Lara McKenzie, Ph.D., principal investigator in the Center for Injury Research and Policy and senior author of the study. "We want parents and kids to keep riding their bikes, but it's important for all riders to wear a helmet. Take your children shopping for bike helmets so you can find ones that fit them and they can choose a style they like. They will be more likely to want to wear it." 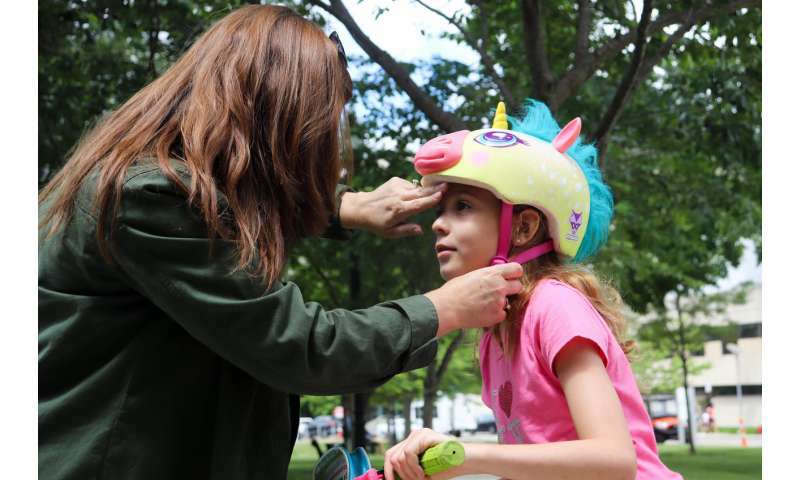 Bicycle helmet laws have been effective in increasing helmet use among children, but fewer than half the states in the US have laws and they are not always enforced. Since bicycling is one of the primary modes of transportation for children, it is imperative to make roads safer for children and decrease bicycle-motor vehicle collisions. Proven prevention efforts include "Share the Road" campaigns, increasing bicyclist visibility with bright reflective materials, creating cycling lanes on the road and providing bicycling education courses.